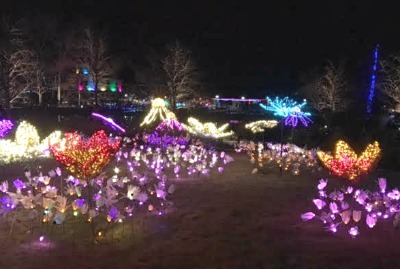 The Dominion Gardenfest of Lights at the Lewis Ginter Botanical Garden in Richmond is a unique way to get into the holiday season while enjoying nature's best. 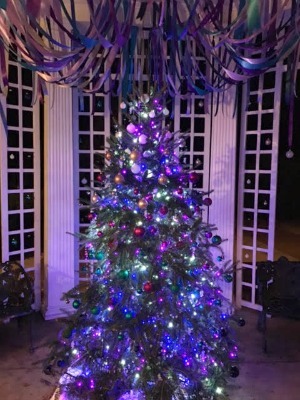 You'll see over half a million lights in extravagant holiday displays as you walk through gorgeous paths and gardens, a glass conservatory/hothouse, a train set, a fire pit just perfect for hot chocolate and s'mores (for purchase), and nightly family friend activities. The hothouse at the Dominion Gardenfest of Lights. If you've been to the Lewis Ginter Botanical Garden, you already know what a beautiful place it is to enjoy the wonders of nature. Full of spectacular plants, wandering paths, hidden corners, a gift shop full of truly unique gifts and garden items, a hothouse full of breathtaking displays, children's gardens and more, the Garden is a great place to spend some time alone or with the family. But in the holiday season, it becomes so much more, as night times turn into the Dominion event. This year's event has the theme "Bringing Art to Light." Just one of several spectacular Christmas trees in the hothouse. Most weeknights, the Garden offers special entertainment at no extra charge. On Mondays from 5 pm to 8 pm, the kids can gather for a story time in front of the fire with the Garden Keeper. Be on the lookout for Santa sightings. Love caroling? Professional carolers will make their way from 6-7:30 around the gardens to bring a little more Christmas spirit into your holidays. On Wednesdays from 5 pm to 8 pm, you'll find free craft projects perfect for kids and their families. Another beautiful view along the garden paths. Enjoy free acoustic musical entertainment on Thursdays nights at 6 pm and 7 pm. Bring your favorite pooch with you to walk through the park ($2 suggested pet "admission") on these special dates: Dec. 6 and Jan. 3. Admission is $13 for adults, $11 for seniors, and $8 ages 4-12 (free for kids 3 and under). It's $7 for members and $5 for members' children. You can purchase admission tickets starting at 9 am on operating days, or you can purchase them online at lewiginter.org. Admission is free for members on Nov. 26-29, and Jan. 7. Check out the Richmond Times-Dispatch on Thursdays. Last year they had for coupons good for BOGO (buy one get one free) admission. Each coupon was good for one free admission. Look for them in these editions: the last two Thursdays of Nov., the first week of Dec. and the first week of Jan. If you can get your hands on a Richmond Valpak in November or December, look for coupons good for $3 off admission. 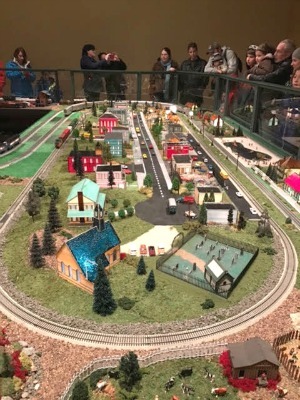 The model trains at the Dominion Gardenfest of Lights. This attraction is open nightly, Nov. 23 through Jan. 7 (with the exception of Thanksgiving, Christmas Eve, and Christmas Day). Hours are 5 pm to 10 pm nightly. Parking is free, but the lot tends to fill up at their busiest times, which include weekends and especially, the week prior to Christmas. 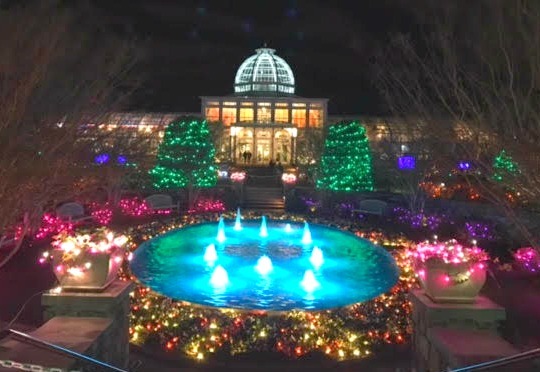 Use this address for your GPS: Lewis Ginter Botanical Garden, 1800 Lakeside Avenue, Henrico, VA 23228. For details, go to lewisginter.org or call 804-262-9887.